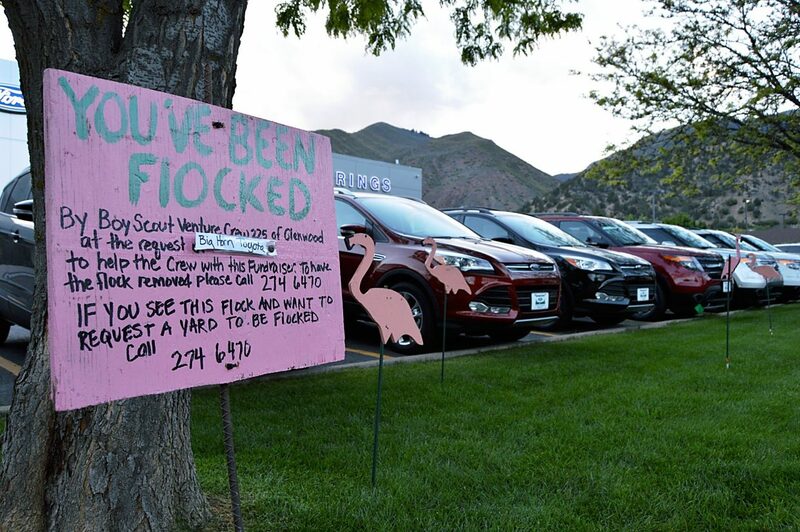 Glenwood Ford/Subaru is one of the latest victims of flamingo flocking, a way the Glenwood Springs Boy Scout Venture Crew is fundraising for a trip to Mexico. Over the past two weeks, you may have seen some curious lawn decorations around Glenwood Springs. The flocks of pink flamingos cropping up on the yards of businesses and homes are the work of Glenwood Springs’ Boy Scout Venture Crew 225, a co-ed group of 14- to 21-year-olds raising money for a trip to Mexico. Here’s how it works: Someone calls to request a flock of 25 handmade, wooden flamingos be put in someone’s yard. The flocked home or business owner can pay $15 for the flock to be removed, $5 for insurance so they can never be flocked again, $10 to flock a friend’s yard and another $10 for a double flock (50 flamingos). One of the crew’s more recent flockings was to the Glenwood Ford/Subaru dealer at the request of Big Horn Toyota, which was flocked by Berthod Motors, which was flocked by European Auto Works. Carmichael said she was hesitant when the crew brought this idea to her. After coming up with the idea, the crew of five handmade 100 lawn flamingos; they cut the wood, painted and put them on sticks. “I want to say they probably have 30 hours invested,” Carmichael said. The crew decided they want to go to Mexico this year to keep working on diving, which they learned on their trip last year to Hawaii. In previous years, they’ve kayaked with whales in Puget Sound, kayaked around Catalina Island, camped for two weeks straight, hiked and biked numerous mountains, scuba dived, snorkeled in the ocean and more. Word is spreading fast about this fun prank for a cause, and Carmichael said they already have 12 places on a flock waiting list. Carmichael said the long list shouldn’t discourage anyone from calling or texting her at 970-274-6470 because they’ll be doing this for quite a while. “Up until they get on the plane,” she said.